Tokyo, Japan -- Dressed in dark cotton robes, a bracelet of prayer beads hanging from his wrist, Gugan Taguchi certainly looks the part. But as he kneels to chant a sutra before an altar in the corner of the room, the people around him continue to chat, and his rhythmic prayers can only just be heard above a Blue Note jazz track. Minutes later Taguchi is back in his seat, glass in hand. A bottle of rum sits on the bar in front of him, next to a half-filled ashtray as his tobacco smoke mingles with the aroma of incense. Some of his peers may disapprove of his methods, but amid a dramatic decline in interest in Buddhism among young Japanese, Taguchi is prepared to go almost anywhere to reach out to the sceptics, including to the Bozu [monks] bar in Tokyo. "I can understand why younger people aren't attracted to Buddhism," says Taguchi, 46, a former salaryman from Hokkaido who turned to the priesthood after his sight became impaired in his late 20s. "Most priests are getting on, and I'm not sure young people want their advice. I'm happy to come here and listen to people talk about anything they like. It's up to them if they decide whether to heed my advice." In the days ahead, millions of Japanese will visit Shinto shrines and Buddhist temples to mark the arrival of the Year of the Rat. For many, this will be the only contact they have with their spiritual roots for the entire year. 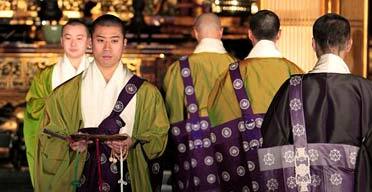 More than 1,200 years after its arrival in Japan from mainland Asia, Buddhism is in crisis. About 75% of Japan's 127 million people describe themselves as Buddhists, but new year apart, many see the inside of a temple only when a local head priest is asked to arrange a traditional (and expensive) funeral for a dead relative. As a result, public donations are drying up and many of the country's 75,000 temples are in financial trouble. Applications to Buddhist universities have fallen so dramatically that several schools have dropped the religious association from their titles. Bozu's owner, Yoshinobu Fujioka, a Buddhist priest who can also mix a decent cocktail for those in search of a quicker path to nirvana, says that Japan's mainstream sects must shed their conservative image to broaden their appeal. "There was a time when people would go to their local temple for advice on all sorts of problems, not just spiritual matters," said Fujioka, 31, who belongs to the Jodo Shinshu (True Pure Land) sect. "This bar is just the same, a place where people can come and talk freely about their problems." Being served sake by a priest is just one of the novel ways in which sceptical Japanese are being encouraged to get in touch with their spiritual roots. Baijozan Komyoji temple in Tokyo has opened an outdoor cafe in front of its main hall, and in Kyoto, Zendoji temple operates a beauty salon. At Club Chippie, a jazz lounge in Tokyo, the saxophone makes way for Sanskrit once a month as three shaven-headed monks wearing robes chant sutras and encourage bemused customers to join in. And recently, dozens of Buddhist monks and nuns took to the catwalk in colourful silk robes as part of a public relations exercise at Tsukiji Honganji temple in Tokyo. The event, called Tokyo Bouz Collection, opened with the recital of a Buddhist prayer to a hip-hop beat and ended in a blur of confetti shaped like lotus petals. "Many priests share the sense of crisis and the need to do something to reach out to people," said Kosuke Kikkawa, a 37-year-old priest who helped organise the event. "We won't change Buddha's teachings, but perhaps we need to present things differently so that they touch the feelings of people today." Taguchi believes that the pressures of modern life mean Buddhism's message is as relevant as it ever was. "These days there is constant pressure to appear happy, and to keep fulfilling your desires to stay that way," he said. "You could easily get the impression that people don't need advice from priests, but that's not the case. Everyone experiences times when they're not at their best, when things don't go according to plan." Buddhism found its way to Japan via China and Korea in the sixth century, according to early historical records. In its earliest forms Japanese Buddhism was considered the preserve of learned priests, who spent their days praying for the health of the imperial household from their lairs in the great temples of the ancient capital of Nara. The forerunner of the Jodo Shinshu - True Pure Land - sect was founded in 1175 and promoted the idea of gaining salvation through belief in the Buddha Amida. Jodo Shinshu continues to have millions of followers today. Zen Buddhism, which reached Japan at about the same time, proved popular among members of the military elite, who were attracted by its message of enlightenment through meditation and discipline. Another influential sect, Nichiren, revelled in opposing other Buddhist schools and remains popular, providing the basis for many of Japan's "new religions". They include Soka Gakkai, which was founded in 1930 and whose members went on to form the political party Komeito, now the junior partner in Japan's ruling coalition. Japan's Buddhists have survived several political struggles, notably with the Meiji government of the late 19th century, which promoted Shinto as the new state religion. About 90 million Japanese say they are Buddhist, compared with only about 1% of the country's 127m-strong population, who consider themselves Christian.